I will be at the Naples Zoo Caribbean Gardens on Saturday April 24, 2010 from 11:00 am to 3:00 pm promoting ARTScool at the Party for the Planet 2010. Sample Zoo Town building block. 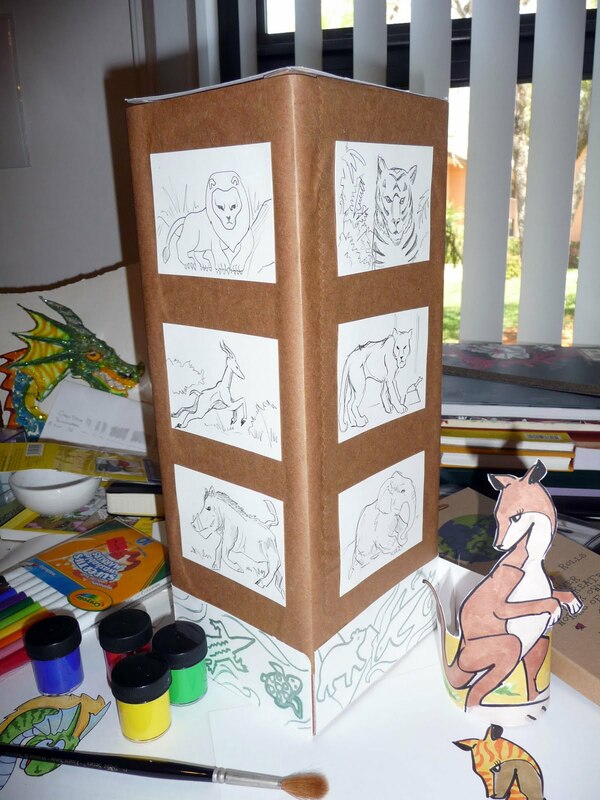 We are going to have a selection of salvaged cardboard boxes along with several art supplies (paints, brushes, markers, construction paper, and glue), so that the kids can use their creativity to draw, color, paint, cut and paste according to their skill levels and build their own corner of Zoo Town. 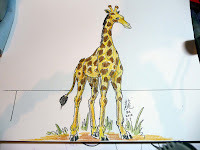 We'll also have a selection of coloring outlines of a few zoo animals on hand to help populate our cardboard Zoo Town. Examples of animal cut outs colored with Prismacolor Double Ended markers. Quick and easy "painted look" after the dry watercolor pencil marks were blended with a waterbrush. 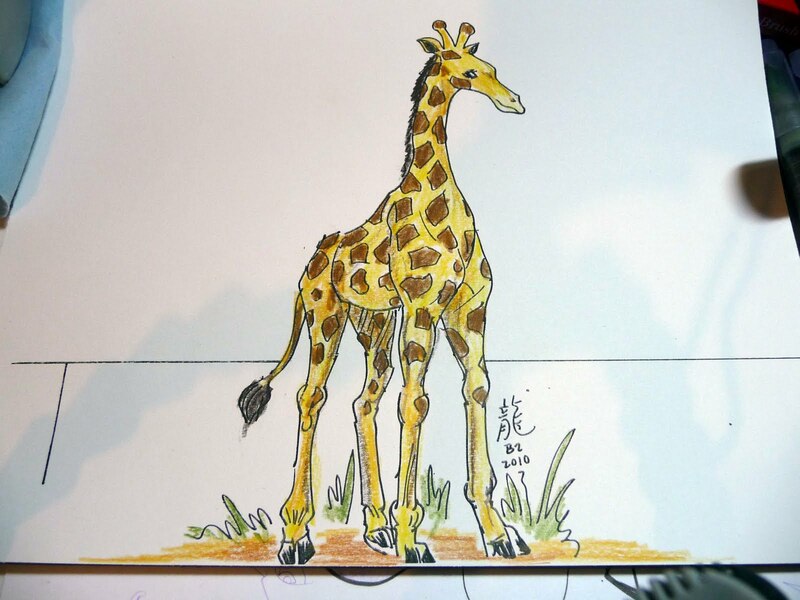 Giraffe outline colored with Faber Castell Albrecht Durer watercolor pencils dry stage. Blending the dry watercolor pencil marks with a wet brush. Demo video of quick cartoon sketch. While the kids are working on their individual Zoo Town boxes, I will attempt to complete as many souvenir cartoon portrait sketches as possible depending on the flow of participants in the art activities. Best plan to arrive early to improve the chances of getting your drawing requests done ;). Collection of cartoon speed sketches with heavy influence from Japanese comics (Manga), animated feature films, and TV series (Anime). Cartooning Classes support materials and samples of students' work. Art supplies reviews for customizing your child's sketching kit. Chronicles of my nieces' artistic development. For a quick list of recommended art reference and instruction books and suggested tools for sketching kits please keep scrolling all the way down on this right column. classes at the Cary Arts Center. 82619 - Cartoon Sketching: License to Draw Everything (age 11-15) Try new art materials to supercharge and refine your current sketching skills while expanding your visual library with the classic archetypes found in Anime and Manga. All sketching levels welcomed since instructor provides individual guidance. You are welcomed to bring your favorite sketchbook and sketching tools. 83085 - Robots, Ninjas, & Monsters (age K5-11) T4 Learn about the three classic archetypes that often appear in Japanese comics as heroes and villains. Learn to sketch your own versions of these archtypes to include in your booklet. Sharpen eye-hand coordination and drawing skills while creating characters and fantasy creatures found in action and super hero movies, Japanese animation, and comic books. 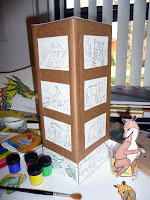 Create a cast and design a world to tell your own stories through comics or illustrated mini books. Class is suitable for beginners as well as advanced students that wish to continue to refine their sketching skills and try new art materials. Listed subtitles are flexible enough, so that each student may focus on the theme of their preference. Also perform for kids' birthday party entertainment, events, and fundraisers with customized 1-2 hours cartooning workshops where kids learn how to sketch dragons, ninjas, mermaids, princesses, and fairies while getting their cartoon portraits drawn. Average speed: 12-15 black & white sketches per hour. Alberto Lung ("Lung" being the Spanish-spelling for "Dragon" in Chinese) completed a Master of Science and worked in Food Safety/Brand Protection for a few years before returning to his artistic roots. As a self-taught artist combining a scientific academic background, a passion for archaeology and mythology, and some Manga inspiration, I currently design and teach cartoon-sketching workshops for children to promote their visual literacy and creativity. I often rely on speed-sketching demonstrations of ninjas and fantasy creatures to engage young audiences and introduce them to suitable art supplies to develop their drawing skills. Love to sketch Sci-Fi and action figure concepts (robots, ninjas, and monsters) while searching for cool art supplies. Feel free to contact me if you need another opinion or advice on selecting your art supplies. 1. Initial supplies: a pack of printer paper and something to draw and color like crayons and regular pencils available at any retailer or local arts and crafts store would be a sensible start. When learning to draw one must go through many practice sketches and fill many doodle pages to loosen up, so it is smart to start with whatever inexpensive tools are already at hand. Once committed to developing your illustration skills, you can gradually try artist grade materials and be able to better appreciate their advantages. 2. Some reliable brands: Crayola, Faber Castell Red Line, Sakura, Pentel, Pilot, Staedtler, Caran D'Ache, Prismacolor, Canson, Strathmore, Tombow. 3. Paper selection: a ream of copy/printer paper is a good value choice for warm-up and practice drawings. For sturdier support choose some scrapbooking paper or 8.5"X11" white card stock. A 9"X12" - 11" X 14" hardbound sketchbook is ideal for documenting each kid's artistic development. A spiral-bound sketchbook is a practical choice for field sketching. 4. Some nice pen and marker choices: Faber-Castell Pitt Artist Pens, Prismacolor Premier Archival Marker Sets, Copic Multiliner Pens, Sakura Pigma Micron Pens, Tombow Dual Brush-Pens, Pentel Color Pens, and Copic Sketch Markers. 5. A few creators to look up for inspiration: Osamu Tezuka, Hayao Miyazaki, & Ben Caldwell. For further reference and other artists’ work check the art books and collections in the Manga/Anime section of your local library and bookstores. 6. What to draw: Choose what you like, for you are bound to draw and practice more often whatever subject you enjoy most. Though every once in a while focus on areas that you might find more challenging and commit a few sketchbook pages to them. Art wooden manikins, family members, plastic animals, and action figures can serve as handy reference models. You might also find yourself particularly motivated after reading some good books or exciting comics, watching a movie or some anime, or attending a theatrical performance. Always have a sketching kit ready to take advantage of those times when you are particularly inspired and charged creatively. 7. If you would like to draw better, sketch everywhere as often as you can: I believe that everyone can draw. It naturally takes hard work and lots of practice to develop your skills. Just like with any sports and other artistic endeavors, proficiency requires constant practice. The beauty of sketching and drawing is that the process is so much fun and that the minimum materials required are quite affordable and portable. Attending workshops and classes available in your area will expose you to other artists' methods and styles and help you find your own style more quickly. There are many books and online resources to help you along the way. I have compiled a list of some of my favorite reference books near the bottom of this column. Daniel Smith - What are Pigments? 1. Sakura Pigma Sensei Manga Drawing set is a well rounded starter set with 4 drawing pens of different nib sizes, 0.7 mm mechanical pencil, and eraser. 2. Uni-ball Leadholder - 2.0 mm - F is a personal favorite sketching pencil with its break-resistant F graphite lead that retains its fine point longer between sharpenings. 3. Pentel Graph 1000 for Pro Mechanical Pencil for Drafting - 0.5 mm is my first choice in the 0.5 mm range. 4. Niji Waterbrushes and Caran d'Ache Neocolor II Artists' Crayons make a compact efficient coloring kit. 5. Faber-Castell Pitt Artist Pens provide waterproof archival inks with a variety of nib sizes packaged in convenient sets or open stock. Excellent choice for drawing and coloring. Now also available in Big Brush format for quick coverage of large areas and large scale drawing. 6. 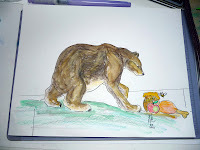 Pentel Aquash Watercolor Crayon Set is a nice compact watercoloring set. 7. Pilot Foam Eraser - Size 10 is a top performing "self-cleaning" eraser that is very gentle with most papers. 8. 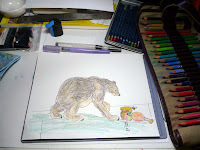 Faber-Castell Albrecht Dürer Watercolor Pencils are a good choice for coloring line art used dry or wetted with a waterbrush. 9. Mitsubishi Hi-Uni pencils are in my opinion the best graphite wooden pencils available in the World, and we are quite lucky that they are now available in the USA. 1. Minimal Starter kit: handful of copy paper sheets and pen or pencil is all that’s needed to start doodling. A clipboard is handy for support and keeping sketches neatly together. A 0.5 mm mechanical pencil would be a good choice since it doesn’t require sharpening and often features a small eraser . 2. Compact Take-anywhere kit: a small 3½" × 5½" Moleskine-type sketchbook, a mechanical pencil, and a nice black gel pen can easily fit in a jacket pocket for sketching anywhere. 3. Regular field kit: a small shoulder bag loaded with a 7" × 10"-9" × 12" double wire bound Canson Field Sketchbook, a mechanical pencil, a couple of Faber-Castell Pitt Artist pens, a waterbrush, and a small watercolor crayons set can cover most situations on a moment’s notice. 4. Portable Studio: keep all options open in a messenger bag or backpack loaded with a large 9" × 12" or 11" × 14" mixed media sketchbook, favorite mechanical pencil or handful of drawing pencils, Pilot Foam eraser, set of pigment liners, pan watercolor set, waterbrush, and anything else you care to carry. 1. Books for young kids: "How to Draw" books by Christ Hart. 2. Books for kids of all ages: "Action Cartooning" and "Fantasy Cartooning" by Ben Caldwell, "The Art of Animal Drawing" by Ken Hultgren, "Let's Toon Caricatures" by Keelan Parham, and "Cartoon Animation" by Preston Blair. 3. Books for older kids: "Drawing the Head & Figure", "Cartooning the Head & Figure", "How to Draw Animals", "Drawing Scenery" by Jack Hamm, and "Face Off How to Draw Amazing Caricatures & Comic Portraits" by Harry Hamernik. 4. Books for teenagers: "Figure Drawing for All It's Worth" by Andrew Loomis (Though originally published in 1943, it is still probably the best book for a solid artistic foundation on figure drawing), "How to Draw Manga Sketching Manga-Style" by Hikaru Hayashi, “How to draw Anime & Gamer Characters” series by Tadashi Ozawa, "Incredible Comics with Tom Nguyen", and "Dynamic Figure Drawing" by Burne Hogarth. Though harder to find, some art books by Japanese Artists can provide a broader perspective: look up the work of Tetsuya Nomura, Hayao Miyazaki, and Capcom's Bengus. Worth a look: "Groundwork of Evangelion the Movie 1", "The Art of Final Fantasy IX" published by Brady Games, "Rahxephon-Official Illustration Collection", and Capcom & SNK Video Games Design and Character Illustration books. "Street Fighter Tribute" by Udon is a nice collection of SF art created by a wide array of artists. 5. Book on Comics creation: Take a look at Scott McCloud's "Understanding Comics", "Reinventing Comics", and "Making Comics". 6. Books on Human Anatomy and Figure Drawing: Even when the goal is to draw mainly in a manga/cartoon style, a working knowledge and understanding of human anatomy can significantly improve the believability of your characters. To that end I would recommend the following Dover value books: “Bridgman’s Life Drawing” by George B. Bridgman, “Drawing the Living Figure” and “Anatomy: A Complete Guide for Artists” by Joseph Sheppard. 7. Additional suggested reading: Also check out books on conceptual art for movies like the "Art of Star Wars" series. Seek inspiration and collect reference material from illustrated texts on Zoology, Archaeology, Mythology, Anthropology, History, Folklore, Travel, and Architecture.